Halloween is almost here! Gear up for the holiday this month by whipping up a batch or two of Halloween themed cupcakes! Take them to work or send them to school with the kids. You won’t get too many people turning you down! Usually, when it comes to making cupcakes, once the icing is on, many people have trouble coming up with ideas for decorating them. They wind up with a few colored sprinkles or pre-made themed candies. While I wouldn’t turn down a cupcake of any kind (as long as it wasn’t truly revolting), there are many wonderful cupcake decorating ideas out there to try this Halloween. Lots of ghosts, candy pumpkins on top of mounds of icing, the usual black cat or spooky black blob of a spider are the mainstream of what you’ll find searching the web. However, this collection of ideas showcases the unusual and/or “too cute to pass by” cupcakes. They had some thought put into them. They are fairly original. Each of the following links will take you to the image and the recipe or directions for how to create the cupcake. For starters, try these “Brain Cupcakes” from for a gory treat. What could be spookier than “Eyeball Cupcakes” staring at you? ? Here is another “Eyeball Cupcake” version. Older goblins might enjoy these “Skull Cupcakes” more than smaller trick-or-treaters. These “Werewolf Cupcakes” may be scary for the little ones, but the older kids will love them. You’ll need to scroll down a bit for these “Revolting Rodent Cupcakes”, but you’ll also find many other Halloween delicacies to create for your party. While the vampire has long been a staple of Halloween, these Vampire Cupcakes are new on the scene. Some may think he belongs in the Cute Cupcake section below, but this one was a bit too pale and icky for my taste. The following cupcakes are definitely for the younger crowd – although I certainly enjoy these cute cupcakes, too. How about scaring up a batch of “Mini Monster Cupcakes” – sure to bring a smile. While you’re thinking about monsters, try these “Sweet Monster Cupcakes” to delight your own sweet monsters. Kids will love this Mummy Cupcake for Halloween! Or, if you want a bigger mummy, try these Yummy Mummy Cupcakes. These Goofy Goblin Cupcakes are really cute! These creatures are definitely not my favorite when found in the backyard. But when sitting on a plate like this Bat on the top of a cupcake, I can’t help but smile. These Spider Cupcakes couldn’t be passed by. It’s the eyes that got me. These ideas should be enough to get you started. And remember, they are only ideas. Don’t worry about making them look just like the pictures. Use what you have on hand. Create your own ideas or just modify these. Even if you really make a mess of them, they'll look perfect for Halloween! After seeing all your goodies, I am all geared up to go out already. 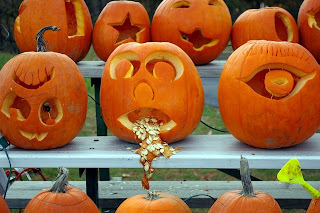 In California, where I live, Hallowe'en is probably the biggest, fun event of the year! Thanks for the comment, Julian! We love Halloween, too, and I've been itching for October to get here! It's just plain FUN!